The Jousting Life: Andre Renier Wins "The Grand Tournament of St Charles"
Andre Renier Wins "The Grand Tournament of St Charles"
This past weekend, August 17 & 18, as part of the "Festival of the Horse and Drum", there was an International Jousting League and International Jousting Association-USA sanctioned international jousting tournament referred to as "The Grand Tournament of St Charles". There were a total of eight competitors including three competitors who are ranked among the top five jousters in the world according to the International Jousting League. 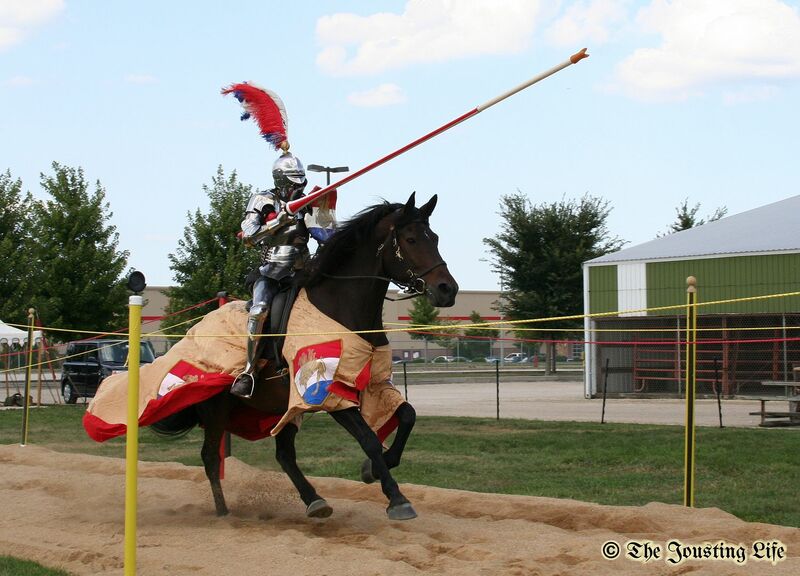 One of those top five ranked jousters is Andre Renier, who earned good scores during the competition, but won the championship based on the votes given to him by the participants in the tournament (including the jousters, ground crew, Lady of Honour and Impresario). 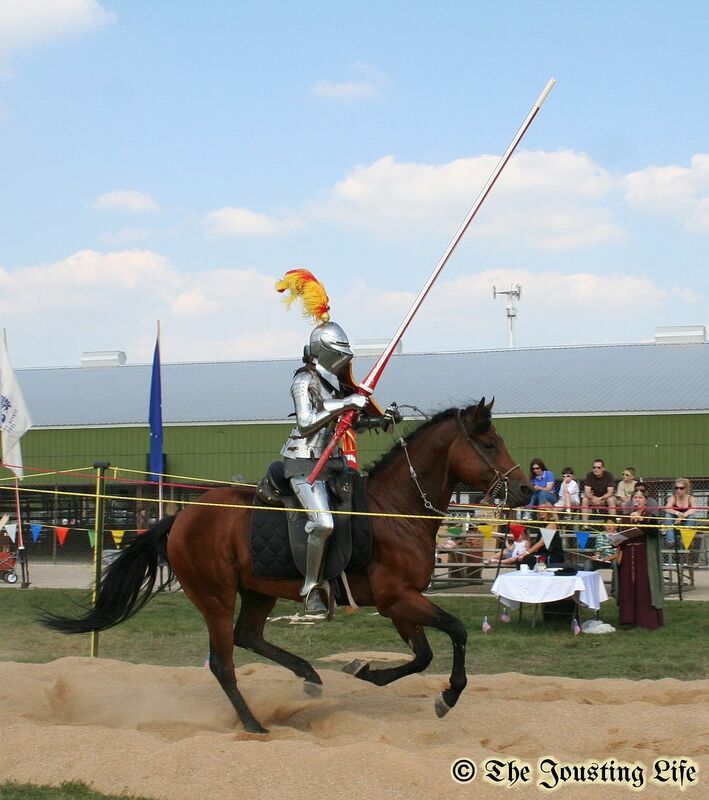 It was not only his jousting skills, but also his chivalry and willingness to help anyone with anything that earned him the title of Grand Champion of the tournament. Here is a short clip of Andre Renier on his Percheron gelding, Chevy, jousting against Steve Hemphill -- another one of the top five jousters in the world -- on his Friesian cross mare, Tinkerbell. 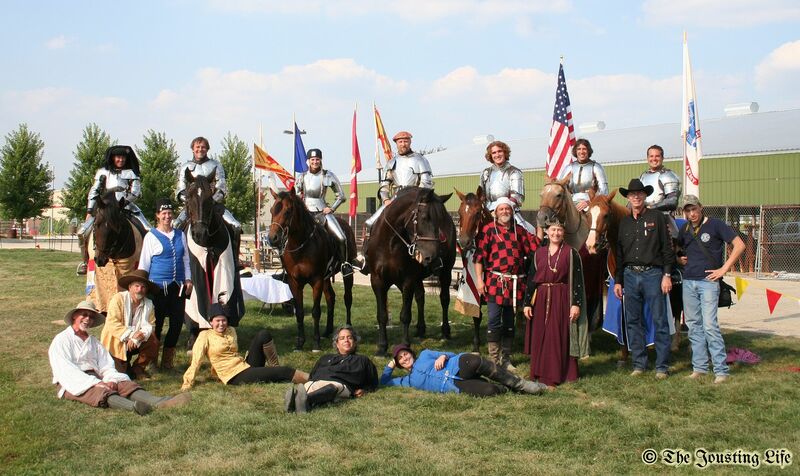 Andre's other jousting horse, the Percheron gelding Riley -- whom he loaned to Australian jouster Sarah Hay for the tournament -- was chosen as the Champion Horse of the tournament. Sarah Hay, who is also among the top five highest ranked jousters in the world, riding Andre's horse Riley, earned the most points during the tilting portion of the competition (what most people think of when they think of jousting). A video of her tilting against Stacy Wasson was featured in an earlier post. 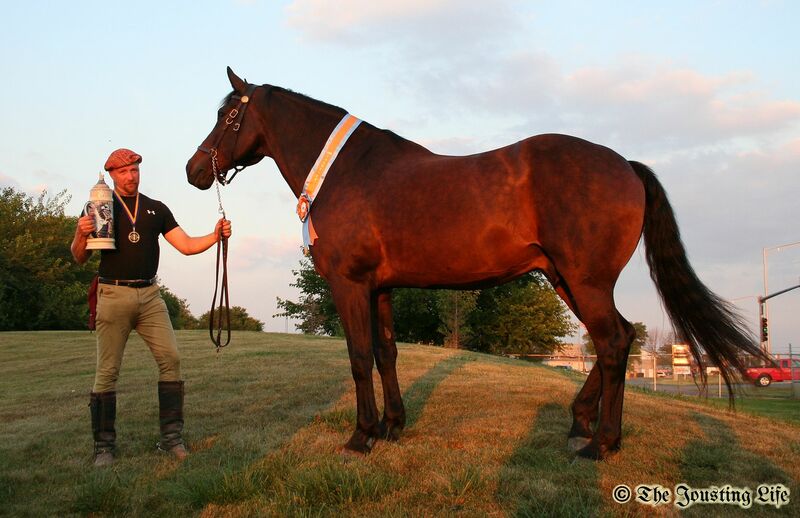 Steve Hemphill, on his quarterhorse gelding Lucky, won the mounted melee portion of the tournament. Stacy Wasson, riding the Azteca stallion Solovino(for whom this was his first experience jousting) and Sarah Hay, riding Riley, tied for first in the Mounted Skill at Arms(MSA) portion of the tournament. You can see video of Stacy's MSA-course ride in an earlier post. 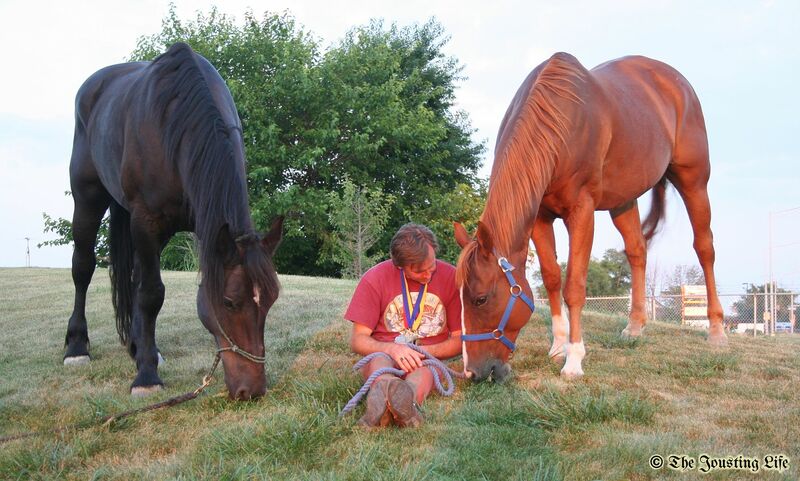 Here is video of Sarah Hay's MSA-course ride. More pictures and video from the tournament will be posted on The Jousting Life YouTube channel and The Jousting Life Facebook page over the next week or so. Practicing for the "Festival of the Horse & Drum"